Cedar Springs Fence, a family owned business for more than 35 years, delivers amazing quality to its government, business and residential customers throughout Grand Rapids, Mid and West Michigan. 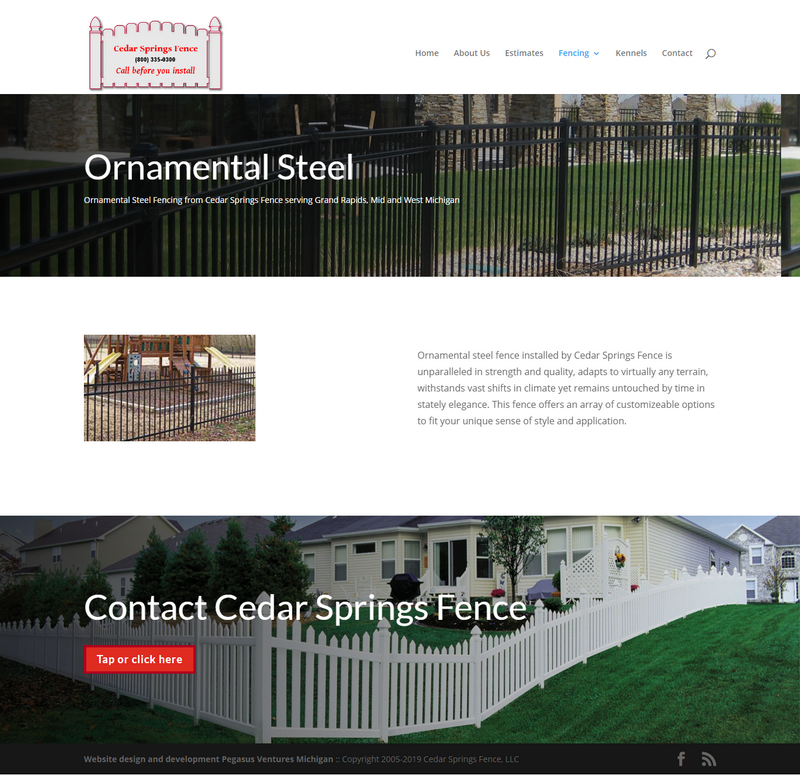 All the way back in 2005 Cedar Springs Fence became website customer number two for Pegasus Ventures Michigan. Creating solid, well organized content for contractors presents real obstacles for both webmaster and client. Getting pictures for your website designer, creating a comprehensive list of products and descriptions for a website never makes for an easy task for a busy contractor. It’s more problematic when the contractor offers clients dozens of products. Suppliers working with smaller contractors tend to operate well behind curve of current best practices in online marketing providing little real support in the way of pictures and brochures. 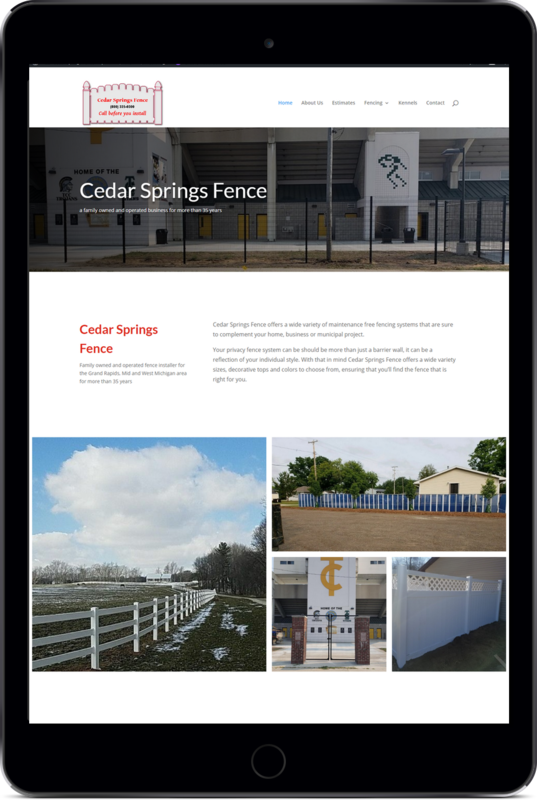 The good news, competitors of Cedar Springs Fence face the same issue and since 2005 Pegasus Ventures has worked to put Cedar Springs Fence out front and on top with limited information. 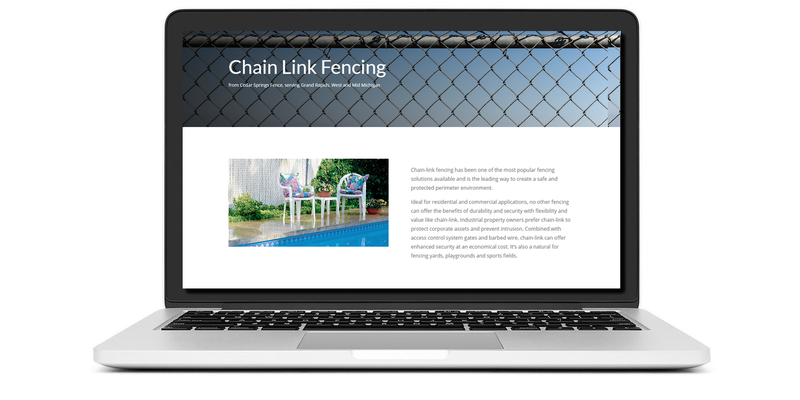 However, three key suppliers of Cedar Springs Fence in late 2018 updated their websites with mountains of great content! Pegasus Ventures Michigan went to work on rebuild of the website to capturing and highlights new content with what’s now become a big project for one of our oldest and favorite customers. And since Pegasus Ventures Michigan charges one price once a year with free updating the Cedar Springs Fence website transformed without additional charges. Picking up the Facebook page starting in 2019, Pegasus Ventures Michigan adds new scheduled posts to Facebook with links to newly added pages on the website. The scheduled posts began in early February and Pegasus Ventures Michigan scheduled a daily post through the end of June with only one repeat for each post New pages added will cover every date in April and June. By the time June rolls around Pegasus Ventures Michigan expects enough content will have been added to Facebook to cover the entire Michigan construction season with scheduled posts to Facebook automatically publishing to Facebook daily.